Amazon.com description: Product Description: Donn Draeger was one of the most famous and well-respected martial artists of the twentieth century, and he was a pioneer in bringing Asian martial arts study to the West. Here, he illuminates the compelling historical, political, and philosophical events that gave rise to the development of the budo arts. The classical budo, or "martial ways" are not combat systems like their forerunner, bujutsu, or "martial arts"; nor are they sports like modern judo, kendo, or karate. They are first and foremost spiritual disciplines, whose ultimate goal, achieved through the most rigorous mental and physical training, is self-realization in the tradition of Zen Buddhism. The author details the history, philosophy, and methods of a variety of these "martial ways," some using weapons and some weaponless, and reveals how they evolved from their combative roots. 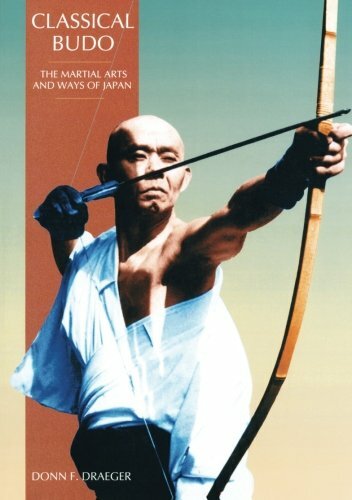 The book includes fascinating artwork from classical sources, and archival photographs of modern budo masters in action. About: Donn Draeger was one of the most famous and well-respected martial artists of the twentieth century, and he was a pioneer in bringing Asian martial arts study to the West.